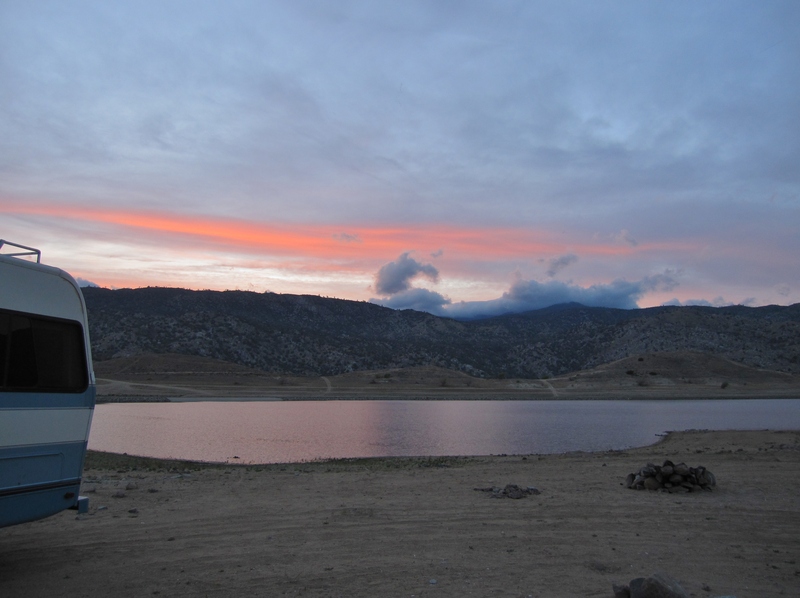 After leaving the heat of Lake Mohave, just north of Bullhead City, AZ, we drove directly to Isabella Lake. I really wanted some cools, and higher elevation would get it done. 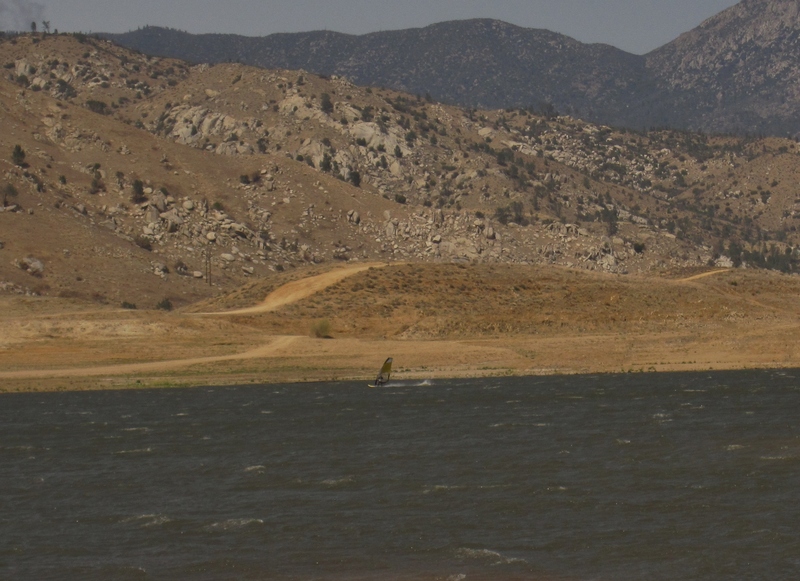 Isabella Lake is northeast of Bakersfield, CA, at the southern end of the Sequoia National Forest. 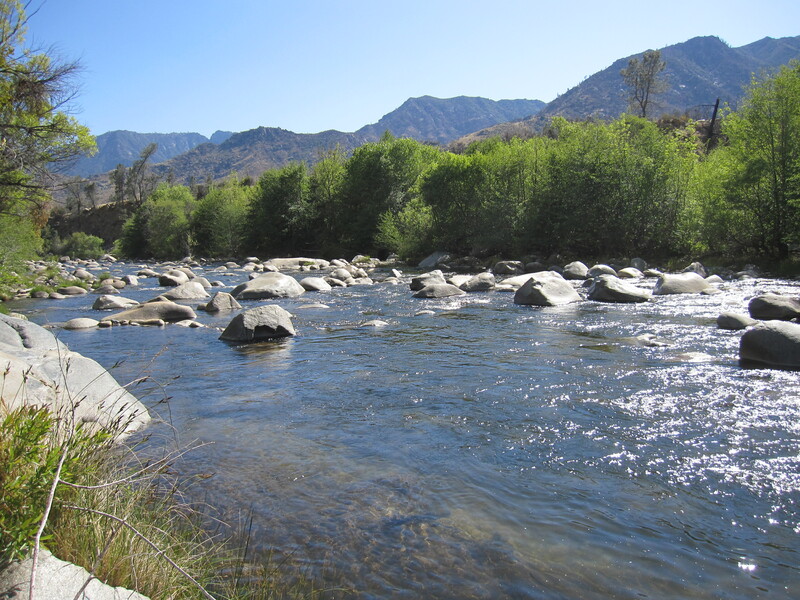 The lake itself is at about 2,600 feet, but the Kern River upstream from the lake gains even more in elevation. 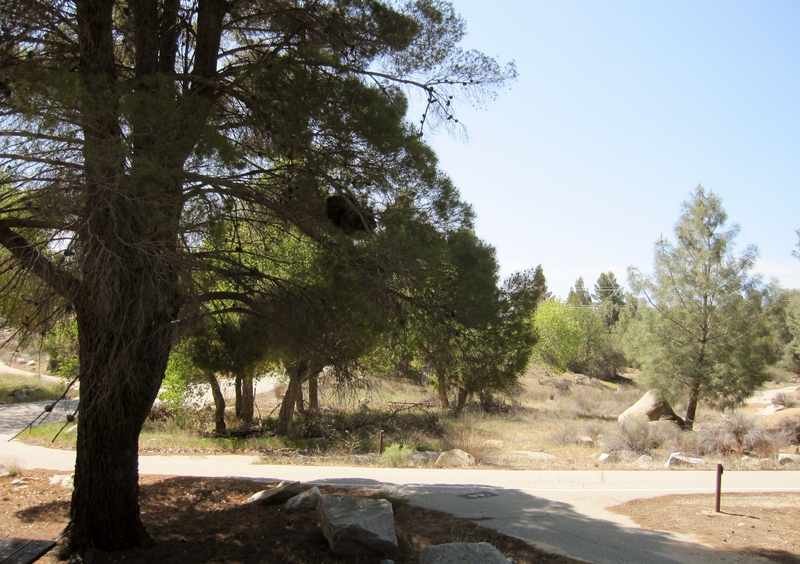 There is a series of Forest Service campgrounds along the river, some developed and some primitive, allowing free dispersed camping. 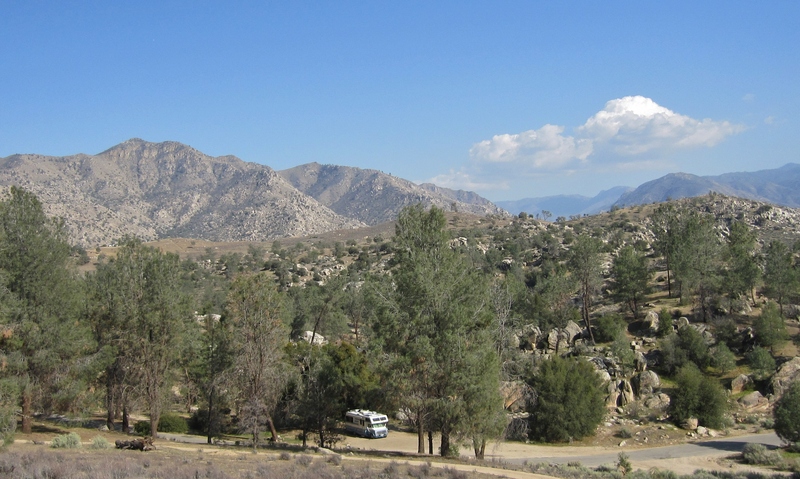 I had heard about the area from Bob Wells while at the Rubber Tramp Rendezvous in January. We had been talking about my plans to visit Yosemite and he was quite familiar with the area. He thought it would be a good spot for April, once southern California started getting hot and Yosemite is still pretty chilly. Anyway, we arrived after a long, 330 mile day. 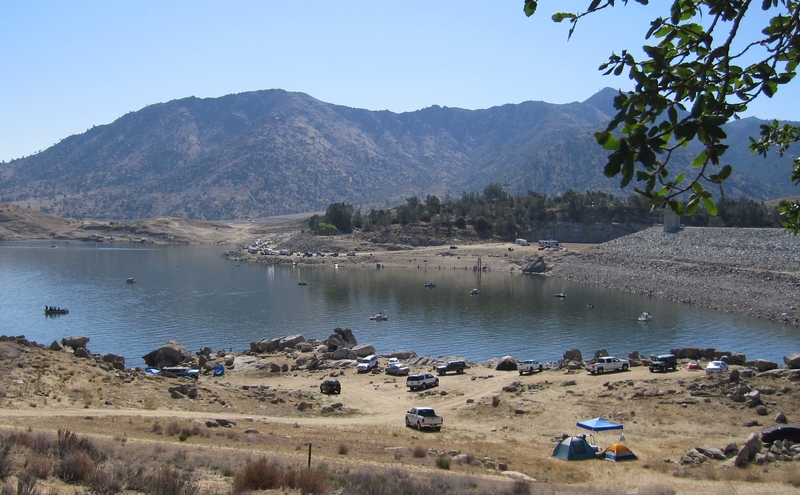 We set up on the shore of Isabella Lake, which allows dispersed camping at the Auxiliary Dam site. Camping is free with the inter-agency annual pass, which I had gotten last year knowing I would be going to a lot of national parks. We got there in time for a nice sunset. We did get our cools. The highs were in the 60’s and 50’s the first few days we were here, so that was great. Bob had warned that it would be windy and he was right. There was a lot of wind in the area with gusts to 35 mph, and on the lake with no trees blocking you really feel it. It’s a big lake. You can’t tell from the picture above. I was on one small arm of the lake. The shoreline visible across the lake is actually a peninsula that sticks out, with another arm of the lake behind it. Then there is another mile or so of lake off to the right. The lake is pretty low right now due to drought and lack of snow melt. There were usually clouds on the mountains across the lake. Mountains make their own weather and it almost always looked stormy over there. Pretty cool looking actually. Also got to watch a couple of windsurfers most days. I couldn’t get a good picture, as they were way out in the lake. This is zoomed in. It’s a big fishing lake and they had a fishing derby April 20-22. On the weekend before (April 12-14) a lot of folks came up, both for recreation and fishing. Probably a lot of folks getting an idea of where the fish hang out before the derby. Anyway, the shoreline was wall-to-wall RV’s. This was about 1/4 of the line. There were many, many more RV’s over to the right. 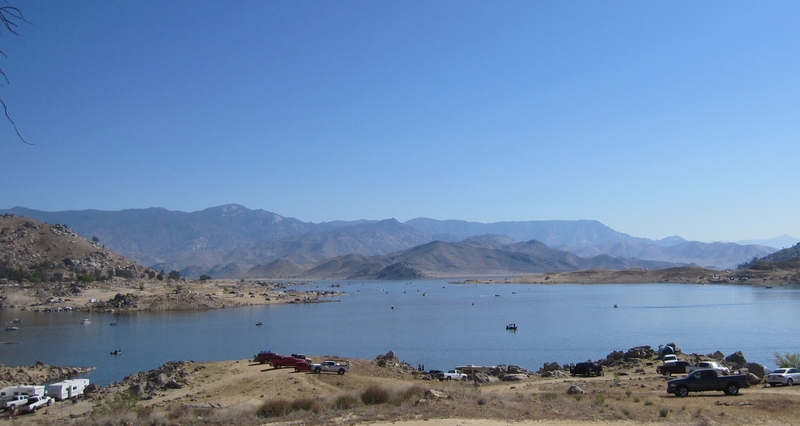 The town of Lake Isabella is just the right size. Small enough to be easily navigated – one main road through town. Big enough to have services, including a really nice Von’s grocery store. One thing I wanted to do was find a place to pick up packages. I needed to place an Amazon order, but needed someplace besides the Post Office that accepts deliveries. Found one at Valley Office Emporium. Also, there’s propane at the big True Value hardware store in town, and a decent laundromat. 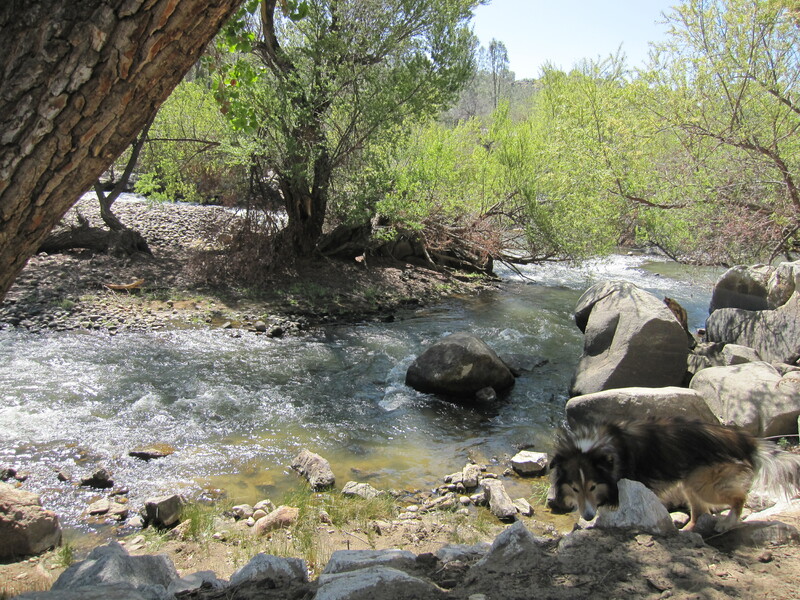 Next we moved across the river, below the dam, to the Keyesville Special Recreation Management Area, a BLM site. 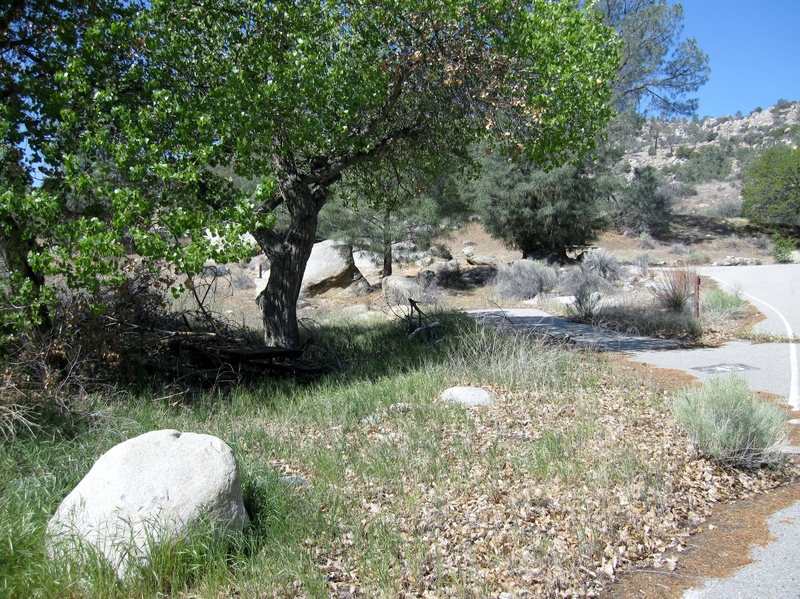 It has a lot of trails for dirt bikes and other off-highway vehicles. Also, they allow dispersed camping. There is one paved road through the area and a lot of dirt roads forking off. Many roads I couldn’t drive too far due to ruts/rocks, and some had low-hanging branches that I wouldn’t fit under. I eventually found a good site right off the road and camped for a couple of days. They allow gold mining in certain sections of the Keyesville area. One day Riley and I were out walking and I met Annie, whose husband Lee is a prospector. (Also met their dogs Miley and Chelsea. Wish I had thought to get a picture.) They are from Salinas, but like bringing their motorhome to Keyesville for a nice trip and to do some gold panning. They were parked in an area right on the river. I wasn’t sure my RV could fit under the trees and over the ruts to get there, so hadn’t driven down there. It looked like a great place to camp, though. Next we moved upriver to the Thunderbird campground. When we pulled in I noticed some rock climbing ladies rappelling down the rock face across the road. 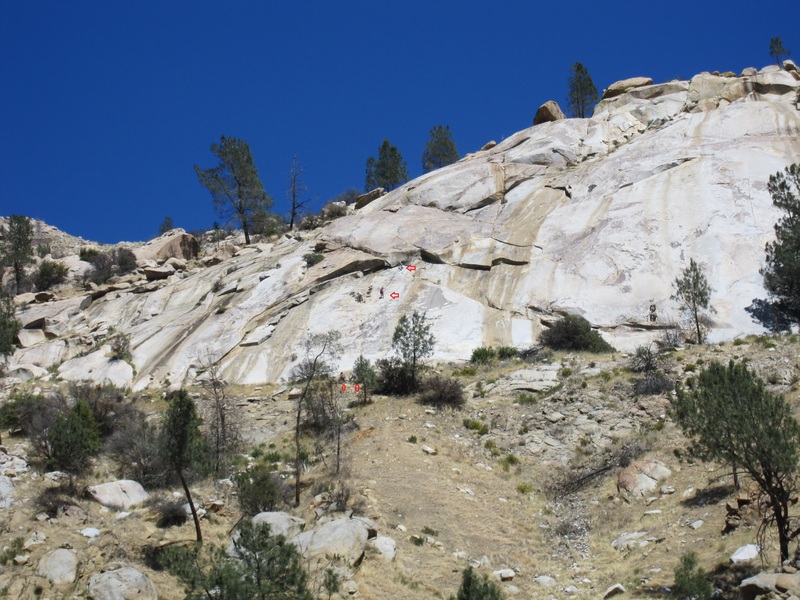 On the 2nd picture below I’ve put arrows where 2 are rappelling down the rock and 2 are already down at the base (click to see bigger). My nephew Kevin is an expert rock-climber. I’d be too scared, but cool to watch. One thing that was cool about the area was the number of fighter jets that fly over the upper Kern river. I saw one fighter jet fly really low over me at Anza-Borrego. It came screaming over the mountain, turned on its side, then straightened up and flew over the other mountains. So cool, but so fast. Couldn’t get a picture. Same thing here. I think they are coming from Edwards AFB south of here. Most days I hear or see 1 or 2. On the 18th it was super-crazy with the jets. I think I saw 12-14 of them on that day alone. Just screaming up the river, following the road/valley. One was really low, actually in the valley, maybe a couple of hundred yards up. Not sure what that was all about, but crazy cool. Must be having a lot of practice runs, or trainees are getting some fly time. Sure wish I could get a picture. They go by too fast to even think of getting out the camera. On Friday, the 19th, we packed up and moved upriver. 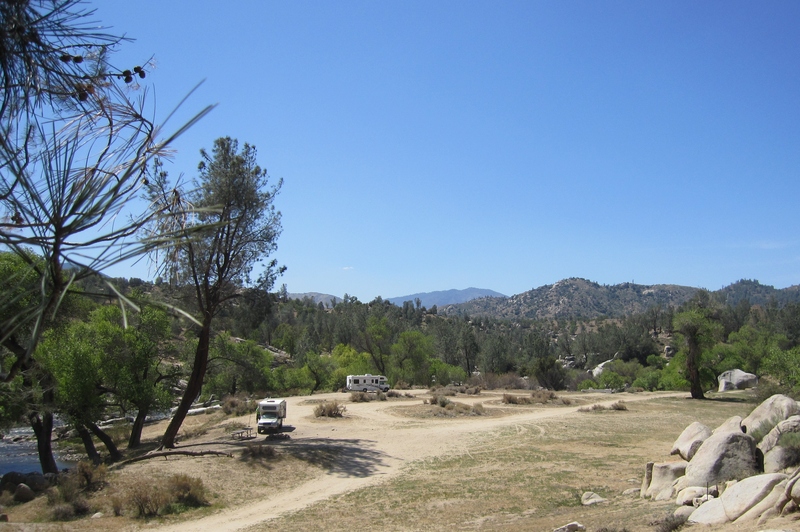 I wanted to see if I could find a site at one of the other campgrounds, like Springhill. On Google Maps it looked like there are some shady sites there (it was getting a bit warm). Both Springhill North and South had a lot of sites, but either small or with too many low-hanging branches to be able to get too far in. Eventually I had to turn around in a small space when the campground road ended. 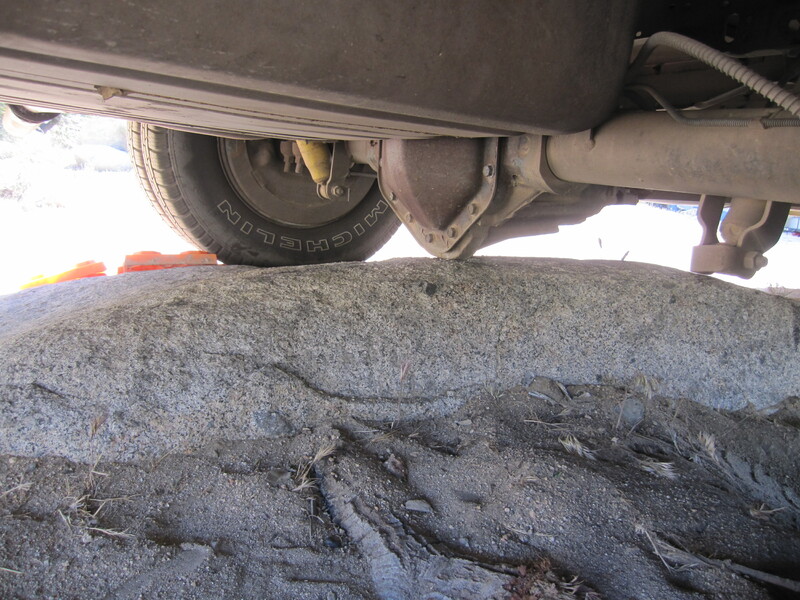 In the process I somehow managed to drive over a rock in the road in such a way as to lodge my differential on top of it. On Sunday, the 21st we moved back to Keyesville. It was hot, Thunderbird had gotten too busy, and I wanted to see if I could get the NASCAR race on the TV. I hoped we could get the same spot we had before (part of it was shady). On the way back downriver I was able to see all the activity on the lake for the fishing derby. Everywhere you could put an RV on the shoreline there was an RV there. Tents were everywhere you could put a tent. Lots of boats. I stopped at a lookout spot and got a couple of pictures. The site I wanted was occupied, but they moved out on Tuesday morning, so I snagged it then. Highs of 85 here lately – need to get shade on the tin can! 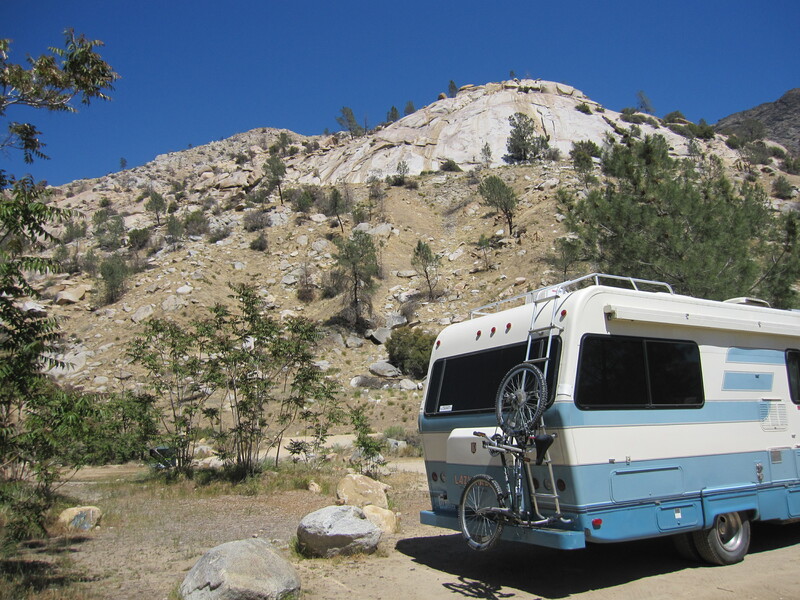 This entry was posted in Bureau of Land Management Campgrounds, California, National Forest Camping by ontheroadwithriley. Bookmark the permalink. How did you manage to get reservations in Yosemite Valley? We’ve tried twice now with no luck. Will be looking forward to your posts about Yosemite, King’s Canyon and Sequoia. We are now aiming for Sept, Oct to be in that area. Have fun! Hi Gayle/Jim! Actually I originally had reserved May 21-23, but 3 separate sites. That was back in January. I searched as a one day reservation and booked 3 days separately. Then I cancelled those (cost 3 x $10 because 3 separate reservations), and redid the search and rebooked 3 new sites. I don’t mind moving each day to a new site. Just happy to get to camp in the valley for 3 days. Enjoyed reading about your time at Rockhound with Barbara and Jimbo (and Katie and Chica!). They are good people and I loved Rockhound S. P.
Glad you got some help to get unstuck! Can’t wait for news from the next place. Sure is pretty country. 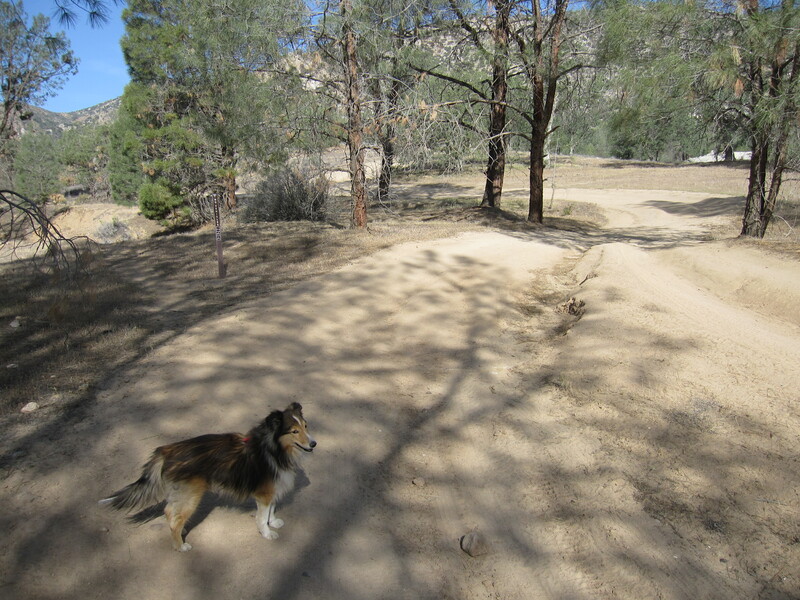 – Dawn (and Katie the sheltie)…we are stuck at home but love reading about your adventures! I have been so busy going and seeing and doing (and taking lots of pictures). Soon as I can slow down and sort through the pics, will post about Sequoia/Kings/Yosemite/San Francisco/CA Coast. So many beautiful places! Glad you are following along! Just found your blog thro’ the GoodLuckDuck. 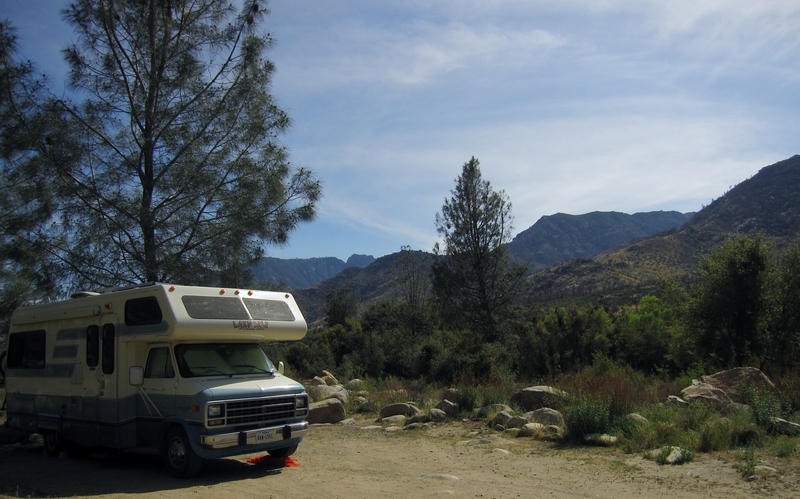 You’ve managed to find some awesome campsites there, although getting stuck cannot be fun! I’ll be following along since it seems our camping styles are well-aligned. Hi Maureen! It sure is a beautiful area. I’m just now going through all the pictures I took of Sequoia, Yosemite, San Francisco, etc. Such a job, I’ve been putting it off. Will update soon.